If you’re a regular reader of disciplemexico.org you’ll have see my comments on the team play of missionaries. We’re blessed to be a part of an international group of ministers committed to seeing God’s purposes advance throughout the world. My recent trip to Florida to meet with ACLAME members was a reminder of how vital this network realizing this goal. Still, regardless of how effective our missionary network is, if our team doesn’t extend to include national believers in the work, our goal of incarnational ministry, of making the work truly part of the fabric of the culture to which we are called, will fall short. That’s why I’m glad to be a part of the team of faculty members assembled to teach at the Bible Institute this fall. 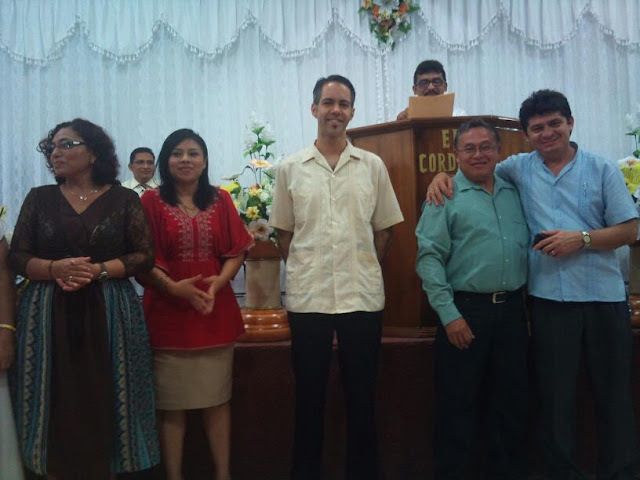 Yesterday, we assembled at the church, “Cordero de Dios” to celebrate the opening of another year of ministerial formation in the Yucatan at Instituto Bíblico Bethel. In all, 28 different professors will collaborate across 3 separate programs. As you can see, it’s an undertaking that requires more that an individualistic effort. So I’m blessed to link arms with fellow national believers to take part in providing an education that will raise up disciples will will strive to do all that Jesus commanded us to do. Is team ministry simply a missionary enterprise, or is it essential in your context as well? Have you seen a good model of team ministry in action? Share about it.